I know I am not admiring at Mona Lisa at the Louvre or wandering on the streets of Met; but there is something tantalizing in these streets which is making me do the comparison. It is not Sistine Chapel or any art museum of Paris, but it is surely an open art gallery. It is not a mural on the wall but a mansion full of them and a village full of such mansions. Tucked away in northern Rajasthan, in the districts of Churu and Jhunjhunu, is this outdoor art gallery or the Shekhawati region. 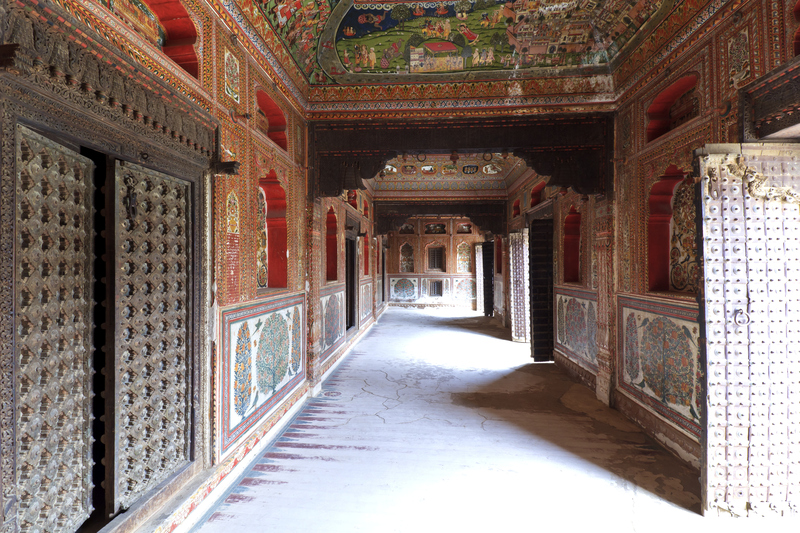 Shekhawati was once a cradle of India’s richest families who built these grand havelis and decorated them with frescos of such jaw dropping ideas and details. Though the Marwari diaspora has now dispersed across India, their marvels remain in Shekhawati awaiting discovery. 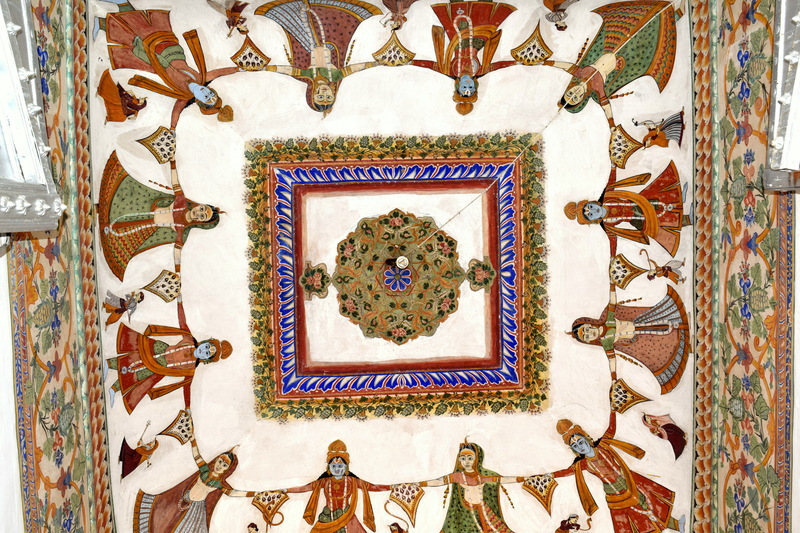 Shekhawati still breathes in its finest painted traditions. The rich Marwari families brought some of the finest European and Indian artists together to bring alive their walls. 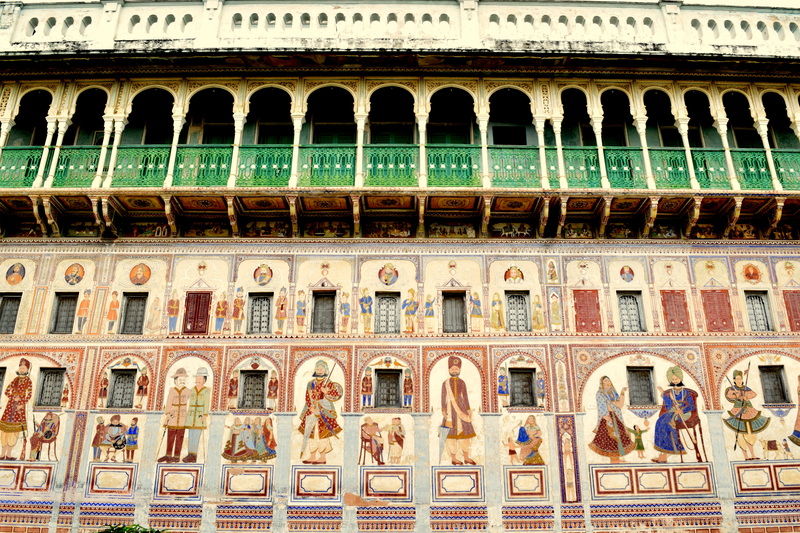 These walls were enlivened with artistic retellings of Indian epics and fables, murals of locomotives to depict a rail journey for citizens, Europeans in a horse carriage or taking off in a hot air balloon, trade treaties between Indian rulers and French and British merchants, playful depictions of Radha and Krishna, Rajasthani love story of Dhola-Maru and even scenes from Kamasutra. 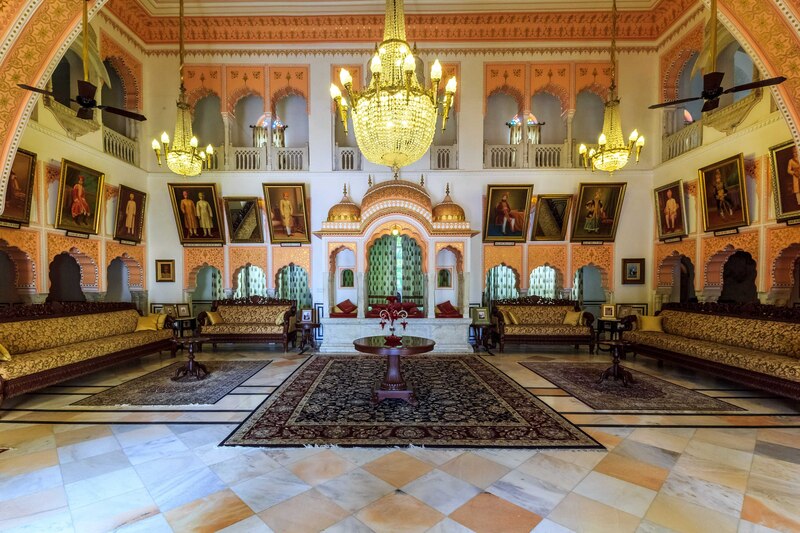 In these havelis, through baithaks or sitting room, ornate silver hookahs, Belgian glass chandeliers, stinted glasses imbued with folksy perspectives and tales, arched gateways, courtyards and durbars; fresco art was celebrated and thrived with family’s growing wealth and prosperity. And this didn’t end at frescos and havelis, the region saw development of many structures from architecturally well laid schools to stepwells to ornate temples as a result of educational and cultural philanthropy of these rich merchants. The grace is in colours used for the murals. Before the 19th century only natural colours like the lampblack and red and green and yellow ochers were used. Limes, indigo, vermillion, cow urine collected from cows fed on mango leaves was used for yellow, flowers and even silver and gold was used for colours. Around 1850s German colours hit the market and became popular with the artists and by the start of 1900s the English chemical colours had flooded the market. One needs to spare atleast 3 days to explore this entire region and that too when you only visit the most conserved and important ones. The best way to do is to start from one end (Alsisar in the north or Nawalgarh in the south) and reach the other. Desolate roads, pastoral charm hung in the air, rugged landscape with occasional acacias and arid shrubs, century old cultural panorama, incredible tales still lived and shared as stories and a massive palace standing as a royal guard conserving the real soul of Alsisar; Alsisar is not just a discovery but a story waiting to be lived. Alsisar Mahal has now been converted to a heritage hotel and has been on forefront in arranging things and experiences that can be branded as ‘Shekhawati’, so be it a Shekhawati food festival or doubling up as a venue for three day music festival in December – ‘Magnetic fields’ or bringing in the concept of village tours, mud dune safari or temple tours. And the Mahal stands as a poster boy of everything ‘Shekhawati’, the gold leaf work on walls, stinted glass paintings, heavy Belgian glass chandeliers, unparallel frescos and ornate durbar halls allow travelers to peer into the grandiose this region enjoyed. They say certain discoveries can take you to a different level of excitement. Mahansar’s ‘Sone ki dukaan’ is just that. It will be difficult to find such elaborate wall paintings with extensive gold and silver leaf work anywhere else in Shekhawati. Episodes from Ramayana played on the walls, surreal images drawn from the life of Krishna and vibrant frescos depicting different incarnations of Lord Vishnu, adorn the wall. Another stop in Mahansar is the Narayan Niwas, old fort which has now been converted into a heritage hotel. Though the property still cries for conservation, it never fails to take you back to an era when Thakurs and Rajas lived here. The alacrity in design has been maintained, the same steep steps, secret doors, narrow alleys leading from one part of the fort to the other, ornate arches, it’s like a ride back to the ages we never lived. At a stonethrow distance away is the Tularam ki Haveli, which looks quite run down, but in it is hidden a marvel of frescos. Probably this small village has the most number of havelis and cenotaphs in the entire Shekhawati. Some are still being used or left to caretakers and not converted into heritage hotels or guest houses. So all you need is to walk down the main bazaar area and take a local help to pick and choose from an array of havelis strewn around you. Some are now in sorry state with the lower storey now being converted to small shops. Ramgarh fresco, (one of the most visited haveli) now being restored and renovated by the Khandelwal family, is more than a century old but still stand tall as an emblem of the dexterity and depth of art of the era. A haveli hopping in this town takes one through some exquisite marvels by the Goenkas which houses a museum of antique collections from the old Shekhawati havelis. Tucked at some distance away from the Goenka haveli are the cenotaphs with its famous painted domes built by the Podars. Any mention of Shekhawati is incomplete without the mention of Fatehpur. Fatehpur was founded by Fateh Khan, a Khimkari or Muslim Rajput in 1451. His successors ruled this small piece of land till the middle of the eighteenth century before being evicted by Sheo Singh of Sikar. The merchant community thrived under the Khimkaris and with them art and culture. 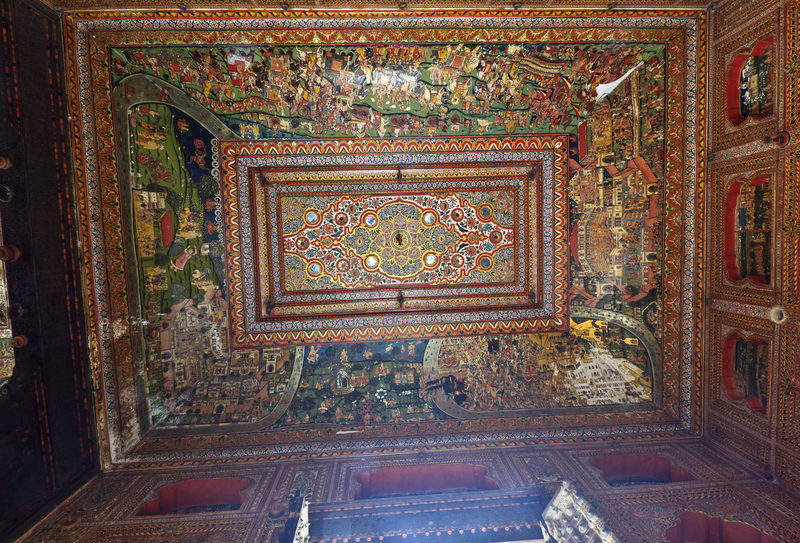 In Fatehpur, fresco painting saw birth of an eclectic mix of rajputana and Mughal style of painting. With this mix of cultures, another school of art evolved and with it more experimentation with colours, from the earthy blend of ochre red and vibrant indigo, the pastel evolved to add yellow ochre to delicate pastels to olive greens to monochromes to delicate shades of turquoise. 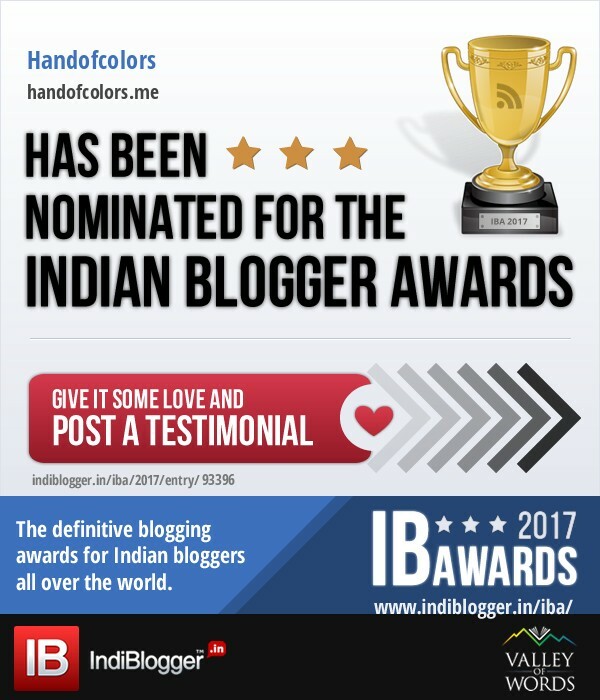 Nadine Le Prince Haveli is the best testament to this evolved style of writing. Built by the Deora family in 1802, the haveli was purchased and henceforth restored by a French artist Nadine Le Prince in 1999. 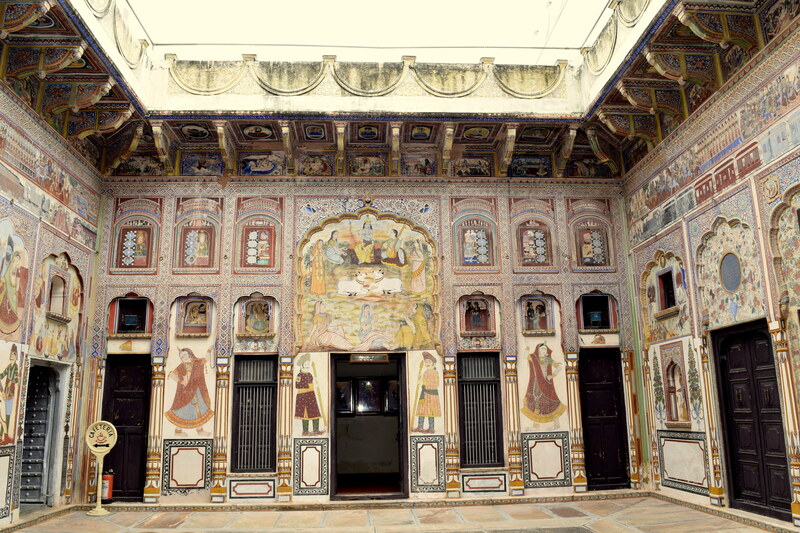 Nedine is now actively involved in preserving and restoring Shekhawati’s unique havelis. Nedine, a descendant from a long line of artists dating back to the 16th century, has established a cultural center in Fatehpur where she exhibits works of various Indian and French artists. At some distance from the Nadine Le Prince Haveli are the havelis of Jagannath Singhania and Hanuman Prasad Nevetia Haveli along with many other strewn in this small town. Could be the most touristy town of Shekhawati, Mandawa pops up everywhere in search engines when searched for Shekhawati, be it hotels to stay in or havelis to visit. But Mandawa wasn’t always like this; in fact it once used to be a nondescript village until it came under the rule of Nawal Singh. He laid the foundation of Mandawa as we see it today and invited rich merchants to settle in Mandawa. Some of the prominent trader families in Mandawa were the Dhandhanias, Harlalkas, Ladias, Chokhanis, Sonthalias, Sarafs and the Goenkas. In those days, Mandawa was the heart of trade in the region. The first stop in Mandawa has to be Mandawa Fort. One look at the fort and it is evident that the different residential buildings in the fort have been built over a period of time and in various styles. From traditional Rajputana styled architecture mixed well with Mughal influences to colonial arches and gateways, Mandawa fort stands as an exemplary of the vivacity of art of this town. One can chose to stay in the section which has now been converted to a heritage hotel or take a guided tour to explore the painted alleys and rooms with exquisite work of mirror and frescos. As light steams in from red and green window panes, detailed work on the walls, pillars and niches gets reflected in the mirrors. Use of pastel colours, and painted chants and verses in the paintings make Mandawa different from other towns. The weird cacophony in images in havelis of Mandawa symbolizes the changing times. As owners travelled across Europe, they brought with them new ideas of gondolas, airplanes and cars, which were faithfully translated on walls by the side of traditional familiar images of gods and goddesses. And then there are images of bowler hatted Englishmen and queens and princess in horse carriages or on how a typical English village looks. An old fort turned into a heritage hotel for adventurers seeking a riding holiday awaits you in Dundlodh. The old fort built in 1750 A.D by Thakur Kesari Singh, stands today as an epitome of cultural amalgamation of Rajputana and Mughal school of Art. The durbar hall of the fort is less frescoed but the regal appeal remains unfaded, but usually it is the adventurers from all over the world willing to trot the hardy Thar and the dusty landscapes who camp in Dundlodh. The riding holidays start around September – October every year. The rides vary from 3-12 days depending on how long one wants to stay in the saddle. With the largest Marwari horses stud breeding farm, Dundlodh has also hosted National Endurance, horse shows and International polo matches. So if one is looking to combine a riding holiday and a tryst with history and culture, Dundhlodh presents the opportunity. 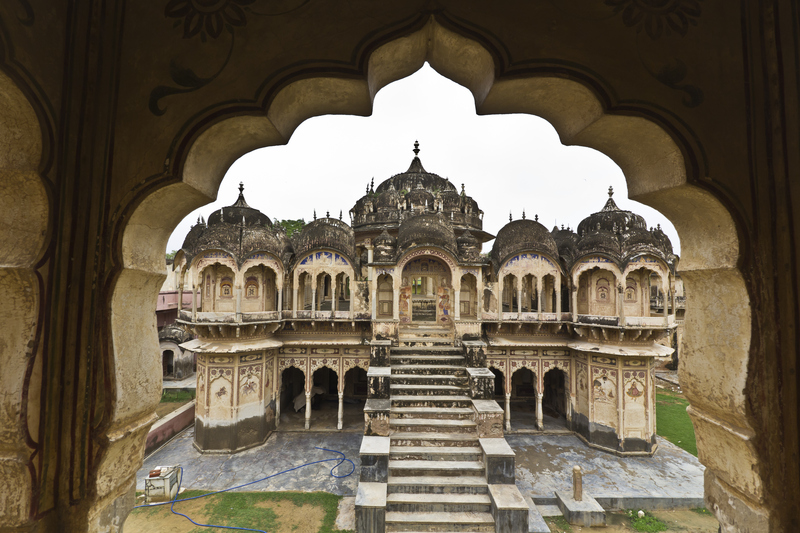 A ride through Shekhawati is not possible without a halt in Nawalgarh. Three kilometers from Dundlodh brings you to a bursting town of Nawalgarh. A town marked by five pols (gates) Baodi, Podar, Mandi, Agoona and Nansa, Nawalgarh still lives in the nostalgia of its heydays. Outside the confinements of the town is the Roop Niwas Kothi, an old country house where the royal family lives. Bhanwar Devendra Singh, has an impressive stable of royal Marwari horses and runs Royal Riding Holidays. In the city is Morarka Haveli, renovated under conservation expert Dr Hotchand and now turned into a museum. Instead of cement, limestone, red mud and sand were used to strengthen surfaces and marble dust and lime to plaster the walls. The paintings were restored using traditional methods and natural colours. 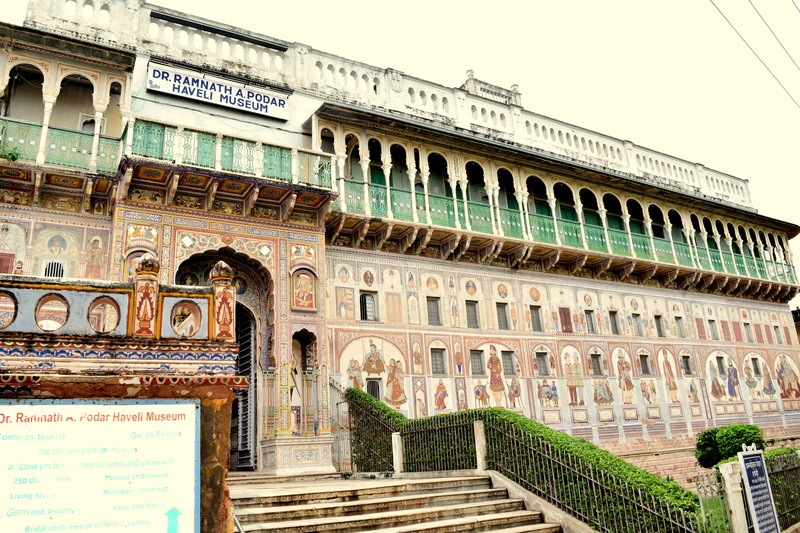 A short walk from Morarka Haveli takes you to Dr. Ramnath Podar haveli which has also been turned into a museum and is a gallery of 750 restored frescos. The walls of the outer aangan have railway coaches drawn on them, probably to show citizens how these looked, along with other murals depicting Indian festivals. The rooms have paintings depicting life of Englishmen and women, providing an inside to their life and culture. Interestingly, this was the phase when the frescos were seeing a shift from the religious themes – by end of 19th century, modern age machines like bicycles, cars, hot air balloons and even airplanes had started sharing wall space with camels and elephants. Infact the entire town is strewn with havelis, cenotaphs and tombs, most in different states of neglect and oblivion. Some like the Grand Haveli have been restored and turned into a heritage hotel. The grand haveli is a bit different from other havelis as it breaks some fundamental laws of haveli development and an excessive use of pillars in its development. The usual Radha-Krishna tales are substituted with colourful leaf motifs and floral patterns. Some influence of English architecture is also conspicuous in architecture. 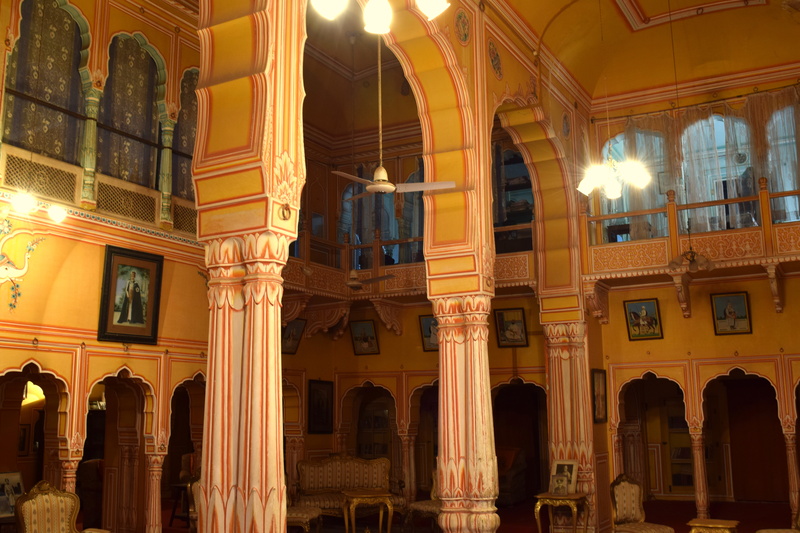 Unlike other towns, many havelis in Nawalgarh are living, most have lost their charm, but those remaining and well restored are leagues ahead of those in other towns of Shekhawati. To reach – One can start the journey from Churu which is around 230 Kms from Delhi and is well connected with Delhi on a direct train route. Alternatively one can take buses that ply from Delhi. Buses going from Delhi to Sikar connect Nawalgarh enroute. The train line on Nawalgarh route is ready but yet to become operational. Both Churu and Jhunjhunu are connected to Jaipur and there are daily buses and trains running between the two stations. From Churu or Jhunjhunu, one can go to one of the villages for a stay. 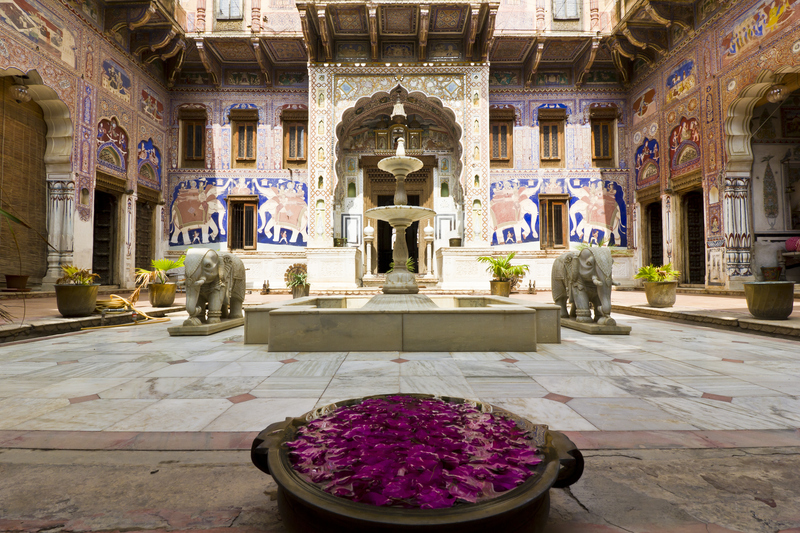 To stay – Many of the havelis in the villages have now been converted to Heritage hotels. One can choose to stay in one of these. Nawalgarh, Mandawa, Fatehpur and Alsisar present better choices than other villages. From there one can get connected to a tourist service for a full day package. It can easily take one 2-3 days to visit every spot in the Shekhawati belt. A full day package should cost somewhere around 2000 – 2500 Indian rupees a day. Local food – Shekhawati is famous for its cuisine, which is a perfect mélange of regal and commoner taste. Do try Shekhawati’s adrak ki daal, Khair-sangri, veggie dish made from raw papayas and lal maas. Would love to visit this place someday soon. I would love to visit this region someday! you make it come alive! Sure plan, this entire region is so beautiful, though we might will have to be selective with places. Kindly be informed that I am trying to contact you regarding a business proposal. 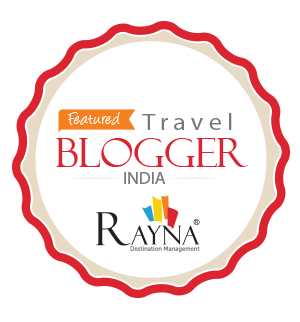 Wherein you can get extra income through your blogspot & websites beside helping your users, followers to plan their trip and explore the places. Please reply on below contact info for further discussion.